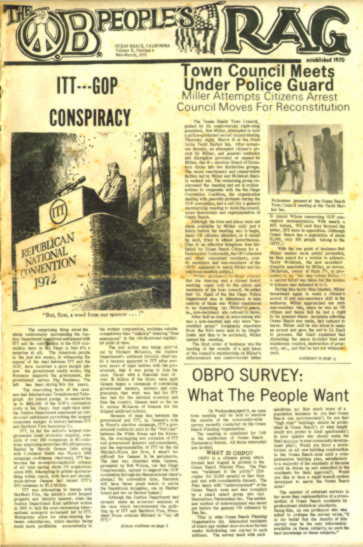 By Fall of 1972, it was the OB Rag’s second birthday – the beginning of its third year, and the community-wide effort to develop alternative institutions was in full swing. The OB Community School was a year old. A childcare center had arisen among needy parents who were assisted by activists. The OB People’s Food Store had opened in a storefront. And finally a new grassroots urban planning organization was in the process of forming, which eventually paved the way for a community frontal attack on the developer-driven Precise Plan. Again, the Rag was on the front lines promoting all of these alternatives, as many of the paper’s staff were involved in these efforts. By now, the paper had taken on more a “professional” look; it was printed on newsprint with 16 pages – for a while it even had justified columns – but usually the text was simply typed out on typewriters. It had more photos and local news, along with poetry and artwork by local residents. Articles included one by Kathy Doyle on her recent ‘natural child-birth’, a “open letter to the male residents of OB” about rampant male chauvinistic behavior in the community; several pages devoted to a Rag staffer’s personal account of the 1972 Republican Convention protests in Miami; an interview with a local progressive concert producer; and finally a fictional piece about the disappearance of the OB Pier. Significantly, this issue also contained two pages worth of advertisements – a clear indication that the paper was being sustained by the businesses that catered to the hip and young. The paper was also sustained by donations — cans were set up adjacent to stacks of issues in 18 stores within the beach area. By then, Deborah Meinkart – who was instrumental in getting the food store off the ground, and Rodney Richardson – who been a hanger-on since the Rag’s inception -had joined the production staff, which also included Dennis & Kathy Doyle, Mari Gray, Davis Hayden, David Diehl, and soon to be joined by Terry, Sean and Myriah. There was a half dozen other regular contributors. The Rag was publishing 5000 copies twice monthly (or at least that was the goal) and was being distributed throughout OB, in markets and stores — at one point, it was in 18 local businesses – and informally on a couple of college campuses, and in a few stores in Mission and Pacific Beach. Importantly, the Rag had established itself as a regular periodical, and its pages contained many ads from local businesses – as mentioned – but this was very significant as it meant that the “hip-eoise”, the hip small to medium businesses, supported the paper and perceived the paper as reaching its potential clientele. As part of the Rag’s philosophy, issues were mailed to inmates free of charge. In addition, the paper was tied into a couple of news services, including LNS -Liberation News Service – an information distribution system outside mainstream media that regularly sent the Rag news, photos, and graphics pertaining to national and international issues as viewed from a progressive perspective. Older Article: Bill of Rights, CANCELED!